15:48 - OK, we'll bring this blog to a close now, but we'll be back tomorrow and every day ahead of the referendum for all the breaking developments from the last week of the campaign. 15:47 - That applause didn't just come from the chamber, but also from the press gallery and the public gallery. 15:37 - Bercow stands to thank MPs for their tributes. There is a tributes motion which he has to put the question of. He expects and hopes for "the loudest unified response in the history of the House". He gets it. "The ayes have it, the ayes have it". The Commons is about to adjourn, but we wants them to follow him out the chamber to St Margaret's church for a service of remembrance for the life of Jo Cox. "Perhaps I can take this opportunity to re-emphasis that our chaplain will also be available in days to come to support members, the staff of members and the staff of this House." The session comes to an end with a loud - and for the Commons very unusual - round of applause. It doesn't die down. It goes on and on. It keeps on going as Bercow leaves. It keeps on going as Corbyn and Cameron and other front benchers file out after them. It lasts for over a minute. I've never seen anything like it in the Commons chamber. 15:33 - Labour MP Mary Creagh looks up at the visitors gallery as she thanks Cox's family for "sharing her with us". She adds: "The world needed her. Rest in peace sweet friend". 15:24 - Alison McGovern, Labour, starts to break down as she reads her speech, but she struggles through. She says she relished her role as a mother. "She had a way of talking, not just about her own life but what we could do together. She fought campaigns we could all feel a part of. How we all long for those arms around our shoulder today. For one more hug and definitely one more smile. Her voice falters as she repeats the 'far more in common' line. Then she maps out the political message in that. "You might be ferociously proud of your hometown as Jo was, but you know compassion doesn't end at its boundaries." What a beautiful line. 15:22 - Tim Farron, Lib Dem leader, stands up. He says Britain has been in "collective grief" these last few days. 15:19 - Stephen Doughty, Labour MP, issues his recollections. He says he envied her and her energy, intelligence and beauty. "She wasn't some do-gooder", in Sudan and elsewhere. She had questions and wanted to know what could be done to improve things. He reads from tributes from their friends. Again, we hear similar recollections - that she loved love, that she was full of energy, that she had steel, that she never just asked what someone felt, but what they should do. 15:14 - It seem's Cox's husband is watching proceedings wth their children. Brendan Cox in gallery of the House of Commons, looking after his children while listening to tributes to his wife. 15:05 - Stephen Kinnock, who shared an office with Cox, is now up. He describes how she brought her kids to the office with her and, if he was lucky, he'd get a "dinosaur drawing". "The fearless Jo Cox never stopped fighting for what is right. She put her conviction to work for everyone she touched, for victims of violence and injustice everywhere. On Thursday Jo was assassinated for what she was and what she stood for. I can only imagine what Jo would have thought if she's seen the poster unveiled before her death. She'd have responded with outrage. Jo understood that rhetoric has consequences. When insecurity fear and anger are used to light a fuse, the explosion is inevitable. It's the politics of hatred and fear. We must now work to build a more respectful and unied country. Jo Cox, we love you, we salute you." 15:00 - I must say it's a terrible shame MPs decided not to mix up their seating arrangements today. If enough MPs had supported the idea, which was considered by the Speaker over the weekend, it would have happened. As I understand it, they said they wanted to be around friends and colleagues. Pity. 14:56 - Andrew Mitchell, a Tory MP who was a close friend of Cox, is up next. He says she made "common cause with a crusty old Tory" (himself). He tells the story of Cox "dressing down" the Russian ambassador for his country's actions in Syria. "She would not want this vile act to change the open and accessible relationship we have with our constituents." She would also want them to redouble their efforts to address the crisis in Syria. "I mourn Jo today as a friend and a colleague. But most of all I mourn for her as a mother". 14:52 - Labour MP Rachel Reeves: "Jo wanted to make the world fairer and more tolerant. Jo appealed to our better instincts. On Friday morning, less than 24 hours after Jo was killed, I was sat in a cafe. A woman came over to me and told me that she hadn't known Jo, but her death made her want to be a bit more like her. She lived the life she wanted to live. But she could have done so much more." She breaks down at the end of her speech, saying that while her constituency can elect a new MP, "no-one can replace a mother". It's deeply moving and terribly, terribly sad. 14:46 - Now David Cameron stands. He says she was "the best of humanity". Cameron says he first met her in 2006 in Darfur. She was criticised by her colleagues at Oxfam for inviting a Tory to meet her. She was a "humantarian to her core". But as she said in her maiden speech, she was proud that she was "made in Yorkshire". He goes on: "Jo's politics were inspired by love." There will be a global demonstration of her life on her birthday this Wednesday, with events in the UK, US, Belgium and several African countries. "A Conservative colleague of mine told me: 'If you lost your way for a moment in the cut and thrust of life, it would be Jo who would remind you.'" May we and the generations that follow us in this House honour Jo's memory by showing freedom is unbreakable and uniting against the hatred that killed her, today and forevermore." 14:40 - Now Jeremy Corbyn offers his tribute. In a beautiful line, he says she "saw a world of neighbours". He adds: "She believed every life counted." The whole country has been united in grief "and united in rejecting the well of hatred which killed her". Cox would have been 42 this Wednesday. "She had much more to give." Corbyn thanks the 77-year-old miner who ran to Jo's aid. "He was stabbed and taken to hospital. The whole House will join me in wishing him a speedy recovery." Corbyn also celebrates the shopkeepers who rushed to help, along with the paramedics. Now he repeats her line from her maiden speech that "our communities have been enhanced by immigration.. we are far more united, and have far more in common with each other, than what divides us." He thanks the Speaker and the prime minister for accompanying him to the town last week. "I've been very moved by the public outpouring since her death. We're united in grief at her loss. Her killing is an attack on our democracy. It is an attack on our whole society. In her tragic death we can come together, to tolerate a little more and condemn a little less." 14:36 - Speaker John Bercow starts proceedings. He says Cox was "filled with and fuelled by love for humanity". She was a "relentless campaigner for equasility, human rights and social justice... Jo was murdered in the course of her duties, serving constituents in need. She fought for them, just as she fought for others." The Commons Chamber is unbelievably quiet. It's very odd to hear it this silent. Bercow says MPs have come to the House to redouble their dedication to democracy. 14:27 - MPs debate on Jo Cox will be kicking off in a couple of minutes. If you want to watch live, head over to parliament's website. 11:40 - There’s a Green split over the EU which helps symbolise the divisions on the left over the issue. Last week, the party’s only MP, Caroline Lucas, wrote a passionate defence of Remain, calling on people to “celebrate free movement and the benefits it brings both here in the UK and for UK citizens working and retiring abroad”. She was quickly attacked by fellow Green members, including her former colleague on the London Assembly, Darren Johnson. Baroness Jenny Jones on the radio yet again to push Brexit. Out of step with Green members and voters. Self indulgent. Embarrassing. Wrong. Partly this is a story about internal party dynamics. Jones is fiercly intelligent and confident. She was one of the few Assembly members who genuinely made life difficult for Boris Johnson when he was mayor. But she is also independent-minded and potentially a bit of a pain for the Greens. Those tensions are being shown up here. Mostly however, the distinction in Lucas and Jones’ views highlights an old dilemma on the left - many celebrate the EU’s notions of shared sovereignty and international decision-making, as well as the opportunities of freedom of movement. Others have always warned of the way centralised power makes it harder to take on market forces and pursue an empowering progressive political agenda. What’s fascinating is how little we’ve seen of those political divisions. Vote Leave's furiously anti-immigration message - to say nothing of that from Ukip-led Leave.EU - pushed most leftists together in opposition to what were plainly very right wing forces. The Lucas-Jones divide is the sort of thing we would have seen more of if the Leave campaign had been more inclusive and diverse. 10:48 - The Labour debate over immigration has formed a key part of the Brexit campaign. There’s a sense of panic in the parliamentary party about how their working class vote in post industrial areas is opting for Brexit out of a sense of anger over the issue. Labour MPs often link that concern to the hammering down of wages due to unskilled workers, mostly from eastern Europe. And that led deputy leader Tom Watson and former shadow home secretary Yvette Cooper to suggest Labour needed to call for reform of freedom of movement. This morning on LBC former shadow business secretary Chuka Umunna also warned of the effect on wages. So it’s worth looking at new research out by the Policy Studies Institute, which suggests that the reduction in wages from European Economic Area workers is “quite small” and that any attempt to get rid of them would accomplish nothing and possibly make things worse. Here's the effect: employers who get ten per cent of their workers from Europe pay a wage that is 0.75% less than comparable employers who don’t. That’s £3.90 per week for a full-time employee at the present average wage level. Hiring that many European workers is very rare. Only 15% of workplaces have over ten per cent European workers. So any reduction in European immigration would have no effect on the vast majority of workplaces. However, in those sectors which do use a lot of European labour, the effect of restricting it could be substantial. The hotels and catering industry uses 19% European labour, business services seven per cent and health seven per cent as well. So if freedom of movement goes, they need to make up that shortfall quickly. But these industries also employ disproportionate numbers of non-European foreign workers and are well placed to increase recruitment from those sources. And that would lead to even greater wage reductions, because a prevalence of non-EU migrant workers in a sector tends to drive down wages even further than European workers. Brexit camps like to say that they would be more generous allowing in non-European immigrants if we stopped freedom of movement, but let’s assume that’s false (it probably is false) and that a Brexit government also introduced restrictions on foreign workers from outside the EU. Well then the wage problem would still remain, according to this research, because employers would make up the labour shortfall using temporary or agency workers. “These have virtually the same small effect in reducing wages as does the use of EU workers,” the report finds. So there’s not much there to suggest that restricting freedom of movement would improve wages. And that’s from a more sympathetic report. PwC’s recent report for the CBI found immigration actually improved wages by 0.7% for someone on the median wage. Reducing it would hit everyone’s paycheck, unless they were in the very bottom five per cent of earners. There’s clearly a perception that immigration drives down wages - and that’s a major problem for Labour MPs - but the research is not bearing it out. And where it is bearing it out, it doesn’t necessarily mean cutting immigration would improve things. 09:48 - Nigel Farage, for his part, was unapologetic. He told the Today programme he’d released a similar poster during the London election which didn’t cause any fuss whatsoever. The outrage in this case was due to the fact that it was released just a couple of hours before Jo Cox died. “I released a very similar poster at the first week of may ahead of the London elections to no comment whatsoever. It’s true, he released this poster during the London elections. It’s interesting that Farage can’t see the distinction between this and the one he released last week. The London election poster shows a long queue of people, represented in the abstract. The EU poster shows a specific set of people - refugees, none of them white - as if they were banging on the door of the UK. It echoes a common trope in far-right imagery and propaganda, from the Nazis to today, where a mob of dangerous, non-white people - predominantly male - are invoked, usually with threats of a rise in sexual assaults. For many commentators and readers, Farage’s poster was the last straw for a man who was always divisive and toxic. But his interviews today - on the BBC and LBC - showed what he does very efficiently: take criticism and pass it off as an attack by the establishment on those who talk about immigration. For many he is now officially beyond the pale. But it's doubtful that any of his supporters will be put off by the events of recent days. The referendum has shown how divided Britain is, and the reaction to Farage is a useful litmus test of that division. 09:18 - Baroness Warsi broke with Leave yesterday over the anti-immigrant rhetoric of the campaign and switched to Remain. Since then, Leave campaigners have put in quite a lot of work to show she was never involved with them. She was clearly an outlier and uncomfortable with the campaign throughout - but she was on the Brexit side. Whatever her official role, or lack of it, her alarm at the rhetoric speaks to the way the focus on immigration has alienated many ethnic minorities who might otherwise have been attracted to Brexit. “How is that poster even defensible? What is that poster even suggesting? First of all it is perpetuating a set of lies about who those people are, where they were going, suggesting they were coming to the United Kingdom. 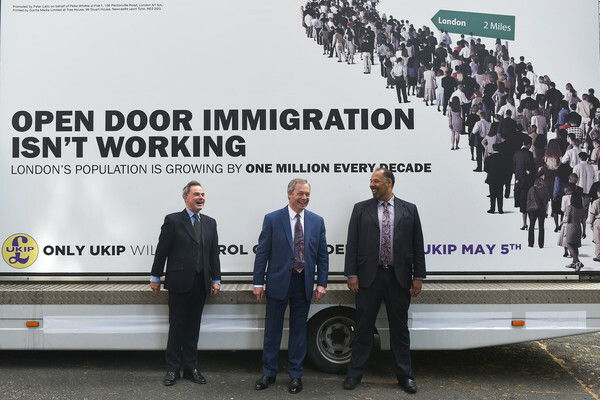 This kind of nudge-nudge, wink-wink xenophobic, racist campaign may be politically savvy or politically useful in the short term, but it causes long term damage to communities. 08:38 - Good morning and welcome to the first of our daily live blogs, where we'll be following the final week of the Brexit referendum as it happens. The main event today will be the recall of parliament, as MPs return to Westminster to offer their memories of colleague Jo Cox. That starts this afternoon. Beforehand, the campaigns sputter into life again, with Baroness Warsi switching from Leave to Remain over Farage's 'Breaking Point' poster and an interview with the Ukip leader himself.